This post is largely to serve as a follow up to some information I presented at the 2012 Council on Social Work Education Annual Program Meeting. If you stopped by my poster and are now stopping by my blog to get more information about this topic, THANK YOU. Here you will find more information in regards to what Participatory culture is and how the New Media Literacies are critical skills that people should be aware of in their pursuit of social media. I encourage you to watch the videos, follow the links, and seek out more information on this topic as I believe it holds extreme potential to impact social work practice. For those of you who have stumbled upon this blog via some other way, thanks for stopping by, and below is a brief introduction to what I presented at the Conference. Social media has transformed the way society is connected and interacts. Government, businesses, and nonprofits are adopting the use of social media by large numbers (Barnes & Matteson, 2009; Kaplan & Haenlein, 2010). However, much of social media in social work centers on the tools and technology of what may or may not be possible. The interaction these tools allow is important but the interactivity is merely a property of the technology. Participation is a property of culture (Jenkins et al., 2009), and is preferred. As one actively participates, one is able to learn new skills and expand critical thinking (Jenkins et al., 2009). A focus on expanding access to new technologies is important, but it only carries us so far if we do not also foster the skills and cultural knowledge necessary to deploy these tools toward more positive ends (Jenkins et al., 2009). 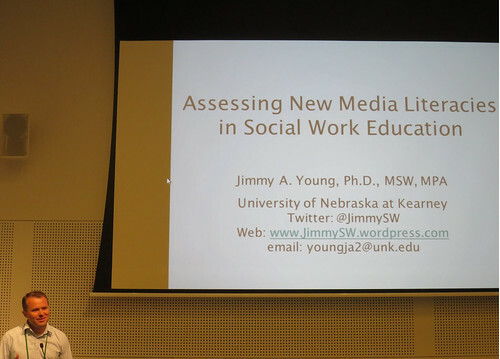 Social media can be used to impact social work education by exploring the concept of participatory culture and how new media literacies (Jenkins et al., 2009) can be adopted into the social work curriculum. Results on what nonprofit human service organizations are currently using and doing with social media provide the foundation for why new media literacy should be part of social work education. The nonprofit sector has outpaced the public and private sectors in the adoption of social media (Barnes & Matteson, 2009; Barnes, 2011; LaCasse, Quinn, & Bernard, 2010; Young, 2012). Social media is used to demonstrate accountability, engage the community, advocacy, promote the organization and services, as well as for marketing and fundraising. To date, nonprofits have had relatively little success using the internet and many have made recommendations on how to use the internet and social media more successfully (McNutt & Menon, 2008; Sargeant, Saxton & Guo, 2011; Waters, 2007). One study with a large and broad sample indicated 11% of nonprofits identified no goals for using social media (NTEN, 2012). Another study (Young, 2012), highlighted that 62% of human service organizations identified no goals for using social media. This is really a scant overview of the literature and there is much more to be reviewed. However, you can also read more about my own research, which I have posted here and a follow up here, or you can simply read my dissertation by visiting Virginia Commonwealth University here. The issue I am trying to discuss with social media and social work is the idea of Participatory Culture and more specifically the New Media Literacies as identified by Henry Jenkins, Ph.D. You can find Dr. Jenkins on Twitter here or view his blog at Confessions of an Aca-Fan. What is Participatory Culture? Essentially Jenkins defines Participatory Culture as a culture with relatively low barriers to artistic expression and civic engagement, where strong support exists for sharing one’s creations, there is some type of informal mentorship taking place where knowledge is being passed along from experienced to novices. A Participatory Culture is also one in which members believe their contributions matter, and feel some degree of social connection with one another. Participatory Culture is a culture that shifts the focus of literacy from one of individual expression to community involvement. I am a visual learner and I value Rich Media Content. You can view the video below to see Dr. Jenkins explain in a much more effective way, what Participatory culture is and how it relates to civic engagement. Although that video focuses more on civic engagement than new media literacies, I think you begin to get more of an understanding about what Participatory Culture is all about. The next video then outlines the New Media Literacies as identified by Henry Jenkins in is white paper Confronting the Challenges of Participatory Culture: Media Education for the 21st Century. A copy of this paper is available for download here. Again, this framework comes right out of the white paper, which can be accessed via the link in the previous paragraph. You can also access the Project New Media Literacies blog for more information. The New Media Literacies help us as social workers to further understand the place of social media in our lives. I would also agree with Dr. Jenkins when he explains that it would be better for us to take an ecological perspective regarding this new digital environment. The ecological perspective resonates with us as social workers because it is part of the foundation of our profession. However, I would step back a minute and try to understand this through the lens of Media Ecology, which I briefly touched on in my dissertation research. Neil Postman (1970) explained that media ecology looks into the substance of how media affect human perception, understanding, value, interaction, and whether media facilitates or impedes chances for survival. “The word ecology implies the study of environments: their structure, content, and impact on people” (Postman, 1970, p. 161). Of course this sounds familiar to us as social workers because we understand how the environment influences our clients, community, and world. I believe that as we take hold of these new digital technologies (specifically social media) that we can use the New Media Literacies as a framework to increase the knowledge of our students and educators. Ultimately, I would view this process as something that happens through collaboration between student and teacher. I think the teacher would essentially act as a guide, while recognizing that students bring valuable experience and knowledge to the process. In fact, this is a process through which I am developing a course for and hope to have going live next fall. Should you know of any social work educators using social media in this way, please leave a comment on this post. I would love to talk with them about their experience. The question remains, what will this look like in social work education? THE ANSWER: I don’t know! I have an idea, but to be honest my idea could totally flop. I think that it is part of what makes this process exciting, the idea of learning from mistakes is incredibly important. However, I do have an example of how the New Media Literacies and Participatory Culture apply to social work education. Essentially my plan is to take a somewhat experiential approach to learning and use the framework to help orient assignments that contribute to the foundation of social work knowledge. These assignments can take on many forms so I will start with an easy example: Advocacy and Awareness. 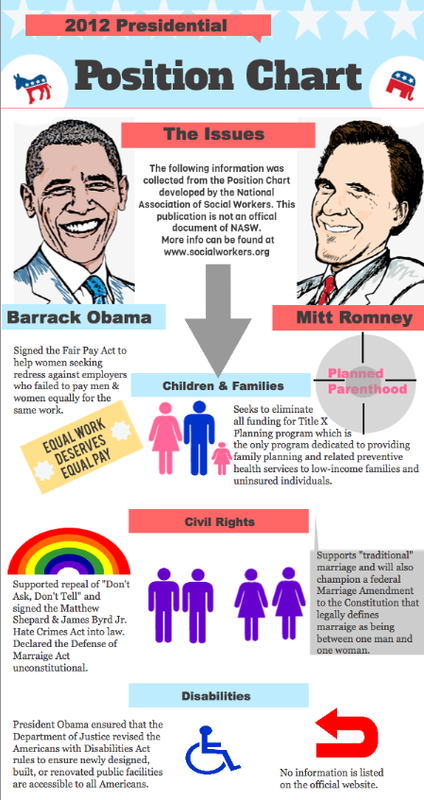 About two months ago, the National Association of Social Workers sent a tweet that contained a link to a document showcasing the 2012 Presidential Candidates position’s on several important areas. You can download a copy of the PACE chart here. I have to say I was excited that someone had taken the time to put together information from the Candidates on key issues so that I could be a more informed voter. I followed the link and downloaded the chart only to discover several pages of text. Go ahead, download it and see what I am talking about. Knowing what I know about the Internet, I figured people would not be as interested in reading this lengthy, albeit important, document. I wondered why they couldn’t put in a format that was easier to understand, like an infographic. After waiting for a couple of weeks I decided to take the candidate position chart and create an infographic to visually display the information in a more dynamic way. As you can see, I utilized the skills identified under the New Media Literacies framework to help me design and create this new chart. Unfortunately, I have yet to tweet it out because I have been to busy to finish it. The fact is I do not have extensive knowledge in Photoshop or even in design. I simply used the Internet to get some ideas (networking), experimented (play) with some software on my computer, and translated (visualization) the document into a graphic that captures the eye and draws interest. The next steps, upon finishing, would be to share my creation with others via Twitter, Facebook, or any other social network. Participatory culture, namely a culture with relatively low barriers to artistic expression and civic engagement, support for creating and sharing creations, and the belief that this contribution matters motivated me to engage in this effort. The informal mentorship took place when I watched YouTube videos on how to use a software program to organize and create my Infographic. This is precisely the type of activities that students can easily engage in using digital technologies and more specifically social media. In fact, many students and other individuals already do this. I understand there are still challenges to engaging in the new digital environment and I’m sure that many will comment on this post highlighting the dark abyss of the Internet and social media that accompanies such unscrupulous activities like cyber-bullying or the anything else that perpetuates negativity. I do not wish to minimize those challenges at all but I do think that if we begin to educate our students about New Media Literacies that we will see positive outcomes. I also believe that as we begin to educate the next generation of social workers who have grown up using social media, we will help them to understand how to use these tools in a way that promotes social justice. Furthermore, just because students have grown up using social media does not necessarily imply they understand how to use it for learning, positive social change, or social work practice. Anecdotally, I have talked with numerous individuals in the human services sector that tell me they need social workers who have a diverse skill set including how to use social media within their organization. We as social workers are ethically obligated to be aware of the changing trends of social practice and to continually learn new ways of helping our clients. We should not shy away from social media, in fact we should embrace it; but only if we can do so using a framework that increases our understanding of how these new skills can help positively impact our practice. Research is beginning to develop frameworks on how to best use social media, and the normative literature has numerous books and blogs devoted to the subject. The response to social media has been positive and negative. However, social media is not going away as it presents another communication channel to connect with many others. Human service organizations are also beginning to adopt social media and social work educators need to understand how to prepare social work students with the necessary skills for effective social media practice. The key premise is that using social media in the classroom or in the field should not be so focused on what tools to use or what those tools allow, although this is important. Educators need to understand the participatory nature of social media and how new media literacies can compliment social work practice. But beyond this, my hope is that people will begin to understand the importance of social media, which many have. However, I really think we need to focus more on the critical learning that these tools allow and help our students to use these tools to engage, promote learning, and promote positive social change. But if you still only want to share photos of your last vacation with friends and family, that’s okay too. If you really want to get an idea of why I think social media can impact social work practice, perhaps I should share with you several of my favorite Ted Talks that have influenced my view of the Internet and what is possible with social media. I created a blog post about this awhile back, which you can access here. I should also include the work of the “Great Explainer” himself, Dr. Mike Wesch, and his Anthropological Introduction to YouTube. Hackler, D. & Saxton, G. (2007). The Strategic use of information technology by nonprofit organizations: increasing capacity and untapped potential. Public Administration Review, 67(3), 474-484. Kang, S., & Norton, H. (2004). Nonprofit organizations’ use of the world wide web: Are they sufficiently fulfilling organizational goals? Public Relations Review, 30(3), 279-284. Kaplan, A. M., & Haenlein, M. (2010). Users of the world, unite! The challenges and opportunities of Social Media. Business Horizons, 53, 59-68. Mansfield, H. (2011). Social media for social good: A how to guide for nonprofits. United States: McGraw-Hill. Postman, N. (1970). The Reformed English Curriculum. In A. C. Eurich’s (Ed. ), High School 1980; the shape of the future in American secondary education (pp. 160-168). New York, Pitman Publishing Corp.
Sargeant, A., West, D.C., & Jay, E. (2007). The relational determinants of nonprofit web site fundraising effectiveness: An exploratory study. Nonprofit Management & Leadership, 18(2), 141-156. Waters, R.D. (2007). Nonprofit organizations’ use of the internet: A content analysis of communication trends on the internet sites of the philanthropy 400. NonprofitManagement & Leadership, 18(1), 59-76.